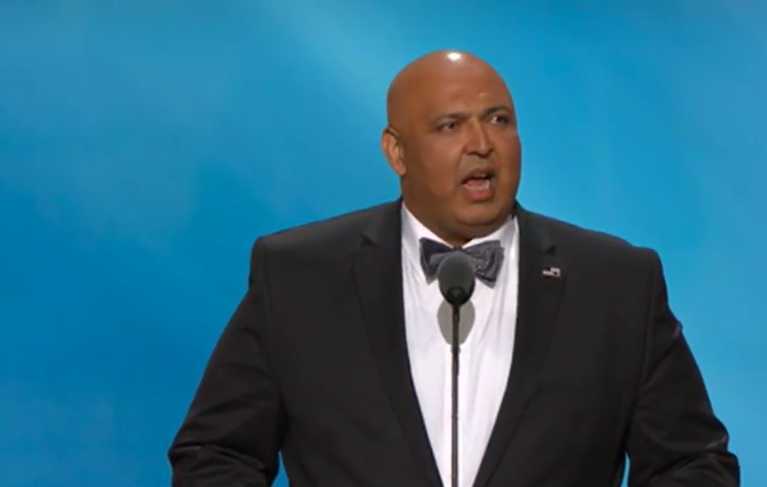 CLEVELAND, Ohio — The founder of “Muslims for Trump” delivered a prayer at the conclusion of the second day of the Republican National Convention on Tuesday, an inclusion that drew opposition from at least one member of the audience. Sajid Tarar, a Baltimore-area resident who immigrated to the United States from Pakistan in the 1980’s, took the podium shortly before 11 p.m. local time to deliver the benediction. He told reporters earlier in the day that he had obtained permission from the Trump campaign to participate in the convention. Some in the crowd echoed back “amen,” but one man repeatedly chanted “no Islam” upon seeing what was happening at the convention. “My obligation is to God. This is an abomination to God,” he said to those around him who told him to keep silent. Kim Coley, who identifies as Christian, told reporters that she found the man’s vocal disagreement to be disrespectful, asserting that Jesus taught tolerance. “He’s usurping God’s authority,” she claimed. In addition to offering a benediction from the stage, Tarar referenced the Islamic religion during his speech, citing a quote from its founder, Muhammad. He agrees with Trump that Muslims seeking to enter the U.S. should be vetted due to concerns about terrorism, and believes that Trump is not anti-Muslim, but only anti-terrorist. On Monday night, Trump supporter Mark Burns, who leads South Carolina’s Harvest Praise and Worship Center, led those gathered in prayer. Paula White of Orlando’s New Destiny Christian Center also delivered a prayer at the opening of the convention.